Call it the new troubadour movement or 'nu-folk', but whatever it's named, there's little doubt that stripped-down acoustics are the new black. This beauty is the epitome of that trend: it's also a close replica of the guitar that Patrick Eggle built for Jake Bugg. "When we got Jake's brief for this guitar, it was pretty sketchy," says Patrick. "We were asked to build a small, all-mahogany guitar. No rosette, no binding, no adornments at all. Once it was built, I realised that we couldn't actually have taken anything else away and it still function." Like Bugg's guitar, this parlour is made entirely from Honduras mahogany, but instead of ebony it uses bocote for the headplate, fretboard and bridge. Internal bracing is Italian spruce, and the finish is 'hand-burnished' nitro-cellulose. Instead of an adjustable truss rod, it has a square steel bar neck reinforcement. Another change from the Jake Bugg guitar is the paddle, as opposed to slotted, headstock. "The mahogany top on these instruments is specially selected for that purpose," adds Patrick, "and it's lighter than the back. It is also graduated in thickness, adding depth to the tone." Playing the Parlour fingerstyle reveals it to be a deeply involving, sonorous guitar: tonally, it's warm, articulate and nuanced - and devilishly hard to put down. 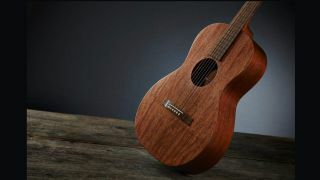 The basic spec for all Eggle models, including the Parlour, is Honduras mahogany back and sides, with spruce top and ebony fretboard, headplate and bridge, with a base price of £2,700. For more info on this and many more glorious acoustics, visit the Patrick James Eggle website.